A lesser-known Shakespeare play, John Logan (Gladiator, Sweeny Todd) adapted Coriolanus into an abstraction of modern politics-he keeps Shakespeare's verse while placing it in an Eastern European setting he nevertheless calls "Rome." Debut-director Ralph Fiennes takes on the title role for himself (he's played the part on stage) and he turns in a charging, relentless performance in a film both hyper-intelligent and self-aware—but may be too emotionally distant for general audiences and too bold in its adaptation for Shakespeare fans. The general Caius Martius (Fiennes) is renamed Coriolanus when he returns from battle and is immediately treated as a political prize tossed about by forces he cannot understand. His mother (Vanessa Redgrave) and a slick politico (Brian Cox) have goals of placing him in office, while only his wife (Jessica Chastain) can see the strain he is under. 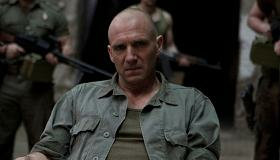 For his part, Coriolanus seems most eager to get back to doing what he knows best: fighting anyone available. The reasons, he seems to feel, are for someone else to identify. Cinematographer Barry Ackroyd, who shot both United 93 and The Hurt Locker, brings similarly gritty whip-pans and jostling handheld to the proceedings here, but also a steely sheen to scenes shot indoors or the news telecasts which pepper the story. The look of the film both heightens its combative realism and intensifies the portrayal of Coriolanus as a wild animal brought in amongst polite society, a man made an expert on the battlefield who is unprepared for the silent blades of political combat. Lying in wait throughout the film is a seething, wraith-like performance from Vanessa Redgrave as Volumnia, Coriolanus's mother. She has all the political sense he lacks, but also a deeply manipulative streak that causes her love for her son to be intertwined with his usefulness. Where his wife, Virgilia (Jessica Chastain) is perhaps the only real emotional calm in his life, she is also largely ineffectual in dealing with him, pushed aside by Volumnia's machinations. Late in the story, Redgrave dominates a long scene with an extended speech that Fiennes wisely stages as the single most theater-bound moment in the film, setting aside all of his modulations to really just let Redgrave strut her stuff. There is something deeply unsettling about the film, not the least being how Fiennes the director seems to work so hard to push the audience from Fiennes the performer, ultimately putting the character at a distance. Fiennes and Logan have created a smart, timely adaptation that is far easier to admire than it is to embrace, a study of an anti-hero without redemption, a man who ultimately dies more for the sake of fighting than for any specific cause. Rating: R for some bloody violence.